How Do I Attach Grant Documents? The Grant Management tool includes features that allow for storage of documents related to a grant application, including the actual application, provided financial reports, and other materials vital to the granting process. When viewing a specific grant, on the main "Grant" tab, these documents will be visible in a list on the right side of the screen. To add a new document, click on the blue "Add a Document" button on the main Grants screen, or click on the "Documents" tab in the upper left. There, you will see a space in the upper left that says "Add a File." Click anywhere within the dotted border to search your computer for the file you wish to add and select it. 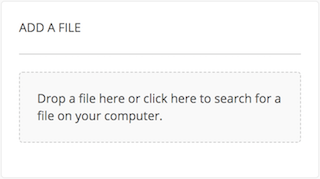 Alternatively, you may click and drag a file from your computer and drop it within the dotted border to upload the file. Be sure to clearly name your file, as this name will be used to identify the document in Virtuous. Note that while basic image files are supported, Audio and video files, including .WAV, .MP3, .MP4, and .MOV, are not supported. Dragging an entire folder from your computer will upload any files within that folder that are valid, though you may also see an error pop-up if the folder contains unsupported file types.